The Wall Street Journal today reported that at least one upcoming iPhone model will include a USB-C port instead of a Lightning connector. If the report is accurate, a single USB-C cable could be used to charge the so-called iPhone 8, 12-inch MacBook, or the latest MacBook Pro models. People familiar with Apple’s plans said the iPhone releases this year would include two models with the traditional LCDs and a third one with the OLED screen. They said Apple would introduce other updates including a USB-C port for the power cord and other peripheral devices instead of the company’s original Lightning connector. That's not a rumor we've heard previously, but The Wall Street Journal is a reputable source that often accurately predicts Apple's plans. Nevertheless, the move towards USB-C has yet to be substantiated by other credible sources, and Apple changing the charging port on iPhones for the second time in five years, after switching from the 30-pin Dock Connector to Lightning connector in 2012, would certainly be a controversial decision. At least one analyst is not convinced that Apple will ditch Lightning on its next iPhones, but he does believe USB-C will be in the mix. Barclays managing director Blayne Curtis told MacRumors that he expects the iPhone 8 to keep its Lightning connector, while he believes that Apple will sell a Lightning to USB-C adapter in European countries to adhere to the European Commission's "one mobile phone charger for all" campaign. This adapter could be similar to Apple's female-to-male Lightning to Micro-USB adapter, which allows an iPhone, iPad, or iPod touch with a Lightning connector to charge and sync with a Micro-USB cable. 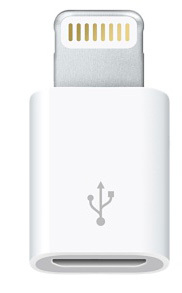 Apple sold a similar 30-pin Dock Connector to Micro-USB adapter in Europe to adhere to EU policy. There is no way Apple would move from Lightning. They have invested so much into the ecosystem, it hasn't hit the limits as far as technical prowess, and Apple's control of the entire implementation allows them to do many things that would require serious work to implement without Lightning's wrapper on USB's transfer mechanism. Did you know that when you plug accessories in, iOS flashes them with the most up-to-date firmware? Or the majority of the handshake between wireless devices (Pencil, Magic accessories) is handled by Lightning? Or even that Lightning's adaptor/connector support is so interoperable that it can survive any foreseeable transition or include any existing connection ever? They've just invested so much from a technical aspect that I see them having a hard time reimplementing much of it with a standard that they don't control. Even the development path says no - if Apple transitions iOS devices to USB-C, they'd have to move controller hardware for supported modes back into the iDevice; at the moment the iDevices only need to control USB traffic and everything else is handled on the cord. Neither is Apple going to allow that complexity - which they worked so hard to move out of the core - back in, nor chance having to make a device larger to support a random array of modes (HDMI, DP are good examples and USB-C's mode set has grown every 6 months) and would never welcome back the days of: "this device only supports these series of connections". Barclays, AKA the guys who downgraded Apple with $115 target one day before the stock skyrocketed. This will never happen. Apple is all about thin. USB is thinner, as far as USB goes, but it's not thinner than lightning. I would love having usb c on the iphone. You could charge your phone with the same cable you use to charge your laptop. That would be awesome. If Apple were listening, they would have introduced USB-C instead of the Lightning port in the first place! Lightning was implemented in iOS devices roughly 2 years before USB-C was even finalized. Yes, but in the US it will be an optional purchase. Guarantee you the iPhone will cost more in Europe than the US and more than $20 too - it always does even after you add in VAT - so stop your whining. The WSJ article could be interpreted as "comes with Lighting to USB-C cord instead of Lighting to USB-A". The wording is vague. *Sigh* You realise this is possible with USB as long as software support is present, yes? I never said it wasn't. I said Apple would have to implement this again outside of a protocol they control, then you hopped in and said I was incorrect about how Lightning actually works. All of that was to prove you wrong. Even so, if Apple sticks with the current method of moving those bits out of iDevices and implements USB-C, that means you'd be bound to certain USB-C cables and Accessories in order to connect correctly to an iDevice. If an iPad doesn't support USB-C HDMI mode and Apple instead relies on some sort of adaptor instead of purely a USB-C -> HDMI cable, I guarantee the confusion and general uproar would be much worse than sticking with Lightning. USB-C isn't some kind of magical unifier of all good, it's actually a very complex and dynamic standard that means a lot of different things to the devices that it is implemented in. Ditching Lightning for USB-C is the smartest move Apple could make. Seriously, it would make everyone's lives so much easier.